Jim Williams has practiced martial arts for 56 years, and trained under Gu Jing-Yu for 12 years in Wu style Tai Chi Chuan. In 1962 Jim started his martial arts training at the age of 14 in Dallas under Allen Steen. He went on to study a variety of styles including Tae Kwan Do, Shodokan, Kempo, and Small Ball Yang Tai Chi Chuan. His main focus today is on Wu Tai Chi Chuan, teaching old Wu Jian Quan form , also known as Large Frame, weapons, pushhands, and ne gung (Chi Kung) for the last 26 years. In his decade of Tai Chi practice, Jim has personally experienced an incredible improvement in chronic health problems. He has also maintained a high level of physical fitness and used his daily practice as a refuge from life's ups and downs. "If you've practiced martial arts before," Jim explains, "you'll find much that is familiar in Tai Chi, but the meditative movement adds another dimension to your practice." 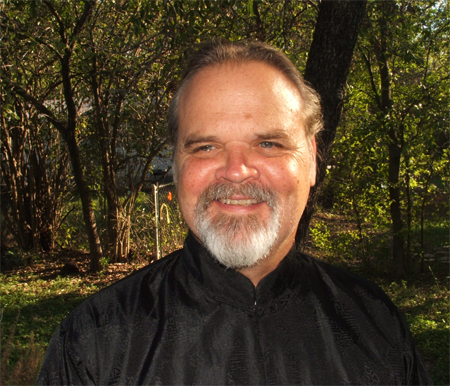 Jim has worked with students seeking low-impact exercise or a form of self-expression, some who are searching for an alternative spiritual practice and as a martial art.